India Vs New Zealand – Hyderabad – 1st Test – Day 3 Review! On a day were only 38 overs were possible, it was still a day of two halves for the Kiwis. The first 19 overs had them losing their last 5 first-innings wickets, with Ashwin and Ojha continuing to tie them down with nagging flight, dip and slow, but significant turn off the wickets. The last 19 were an improvement in approach and batting as they were made to follow-on by Dhoni. Zaheer and Yadav started with pace at either end with Yadav sending back van Wyk soon. Barring James Franklin, the Black Caps seemed starry eyed by the Indian slow bowlers. Ojha’s nagging length and discerning spin had Doug Bracewell caught between slogging and defending and finally perished trying to charge Ojha only to have Dhoni uprooting the stumps. But for dealing with the Indian medium pacers, the Black Caps’ lower-order lacked conviction and failed to provide support to the hard working Franklin. With the 30-run partnership broken between Franklin and Bracewell and the introduction of Ashwin, any hopes of avoiding the follow-on disappeared into the dark and gloomy skies of Hyderabad. Ashwin was the undoubted star, needing only a handful of deliveries to clean-up the Kiwi tail. Soon he sent back Jeetan Patel (10), Boult (4) and Martin (0), there by ensuring India would make the Kiwis follow-on for the first time since 1956. 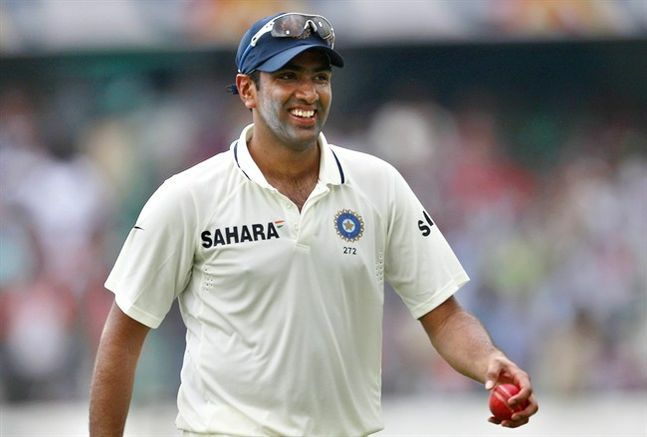 Ashwin would be keen to run through the Black Caps batting line-up to wrap up the test match soon. With the various administrative changes happening in the Kiwi set-up, this batting performance on a typical sub-continent wicket wouldn’t have pleased the new coach Mike Hesson. And for a team that looked suspect against the spin of West Indies not so long ago, and coming in to this series with no practice game, perhaps this was expected. Perhaps Mike Hesson did have a stern word with his wards at the end of the first innings even if it meant he did have a word with the third umpire on a couple of decisions through the first innings (no UDRS in this series). McCullum and Martin Guptill looked up to the task of dealing with the spin and guile of Ojha who opened the bowling for India looking to extract any bounce and bite off the wicket. The openers looked compact and more determined even as the threat of thundershowers loomed large. As play carried on under dark skies and artificial lights, the battle the Kiwis seemed to be battling were with that of discipline. Ojha’s nagging length and turn eventually induced the edge only for Kohli to put down the chance to give Guptill a life. Just when Guptill thought he had done the hard yards of seeing through the initial period and having had a chance put down, he was given out shouldering arms to a straight Ojha delivery. Replays suggested that the ball had turned enough to perhaps miss the stumps. Rain came to the Kiwis’ rescue soon after with only 38 overs bowled in the day. With rains expected through Sunday, the Kiwis would hope the overnight not out batsmen McCullum (16) and Williamson (3) would show the same grit and determination they showed in the hour before the stoppage to give them a chance of saving this Test. As the Kiwi spinner Jeetan Patel said leading in to Day 3, “It’s still low and slow with the seamers – it’s not bouncing as much – but it is starting to take some more turn, which you’d expect.” There is indifference bounce, but the turn is not sharp once the ball gets a bit old. SG balls are prone to aid reverse-swing when the ball gets old, but the pace of the wicket is slow enough for the Kiwis to handle that threat. The rains have been relentless all across the southern portions of India and Sri Lanka. With rain and thunderstorm predicted over the next few days, it is a question of Kiwis surviving the time they get in the middle that is keeping their hopes alive in this first Test. Dhoni and team would look to wrap-up the Test on Sunday though. Just as we thought, Ashwin did! India Vs New Zealand – Hyderabad – 1st Test – Day 2 Review!